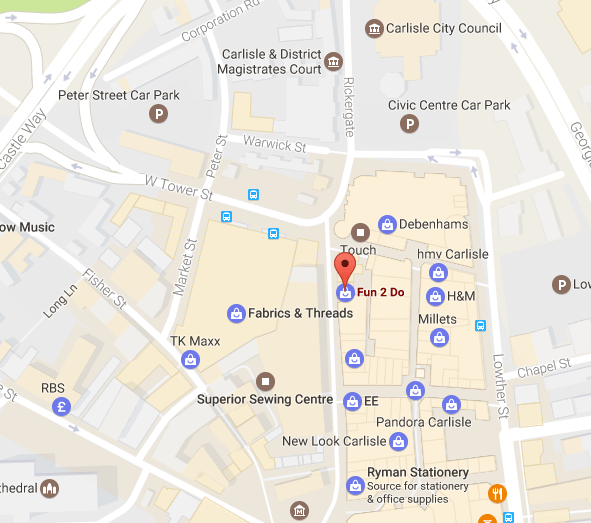 Our Courses in Carlisle are hosted by the popular Fun2Do craft store on Scotch Street. The venue offers easy access to Carlisle Railway station and Carlisle Bus Station. There are a number of pay and display car parks close by which offer long stay. The training room is located on the first floor but due to the age of the building there is no lift access. Fun2Do is a family run business where you can find an Aladdin’s cave of craft goodies and all of our workshop delegates will receive a 10% discount voucher on the day which they can use in the store. Refreshments are provided on your arrival and morning break. We do not break for refreshments in the afternoon so that we can finish by 4.00pm. We break for an hour at about 12.20 for lunch. A number of shops and restaurants are very close by.